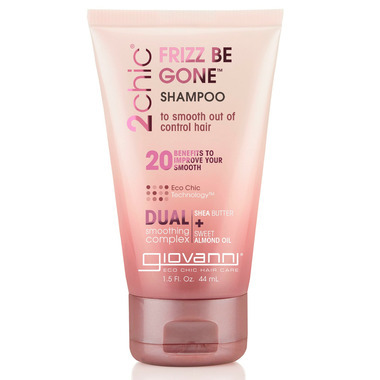 Giovanni 2chic Frizz Be Gone Shampoo Travel Size improves your smooth with organic essential oils that know how to tame your mane. Directions: Massage shampoo into wet hair, creating a rich lather. Rinse. Frizz silenced, smoothness awakened. Magnify your results with 2chic Frizz Be Gone Conditioner for the ultimate in conditioning and frizz control.